I've seen this around the web and wasn't really sure what it was all about . . . have you? Well . . . it sounded like such a wonderful idea that I decided to join the fun and "hop on the magic carpet" too. All you have to do is leave a comment on this post by midnight, February 14, 2010, indicating your email address for a chance to win. Please be sure to include an email address so that I can contact you if you do in fact win. One winner will chosen using random.org based on the number of entries. I will be announcing the winner by noon on February 15th! What's the prize you ask? Well . . . it will be this lovely handmade purse . . . I made it out of an olive textured upholstery fabric and it is lined with a simple black cotton fabric. Braided trim is used for the handles and the loop closure along with an oversized black shank button. UPDATE: February 5th, I have added a second giveaway . . . 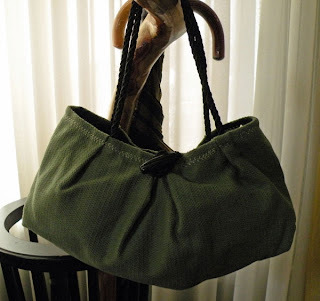 This bag is done very similar to the green bag except with a soft gold chenille fabric and a round button this time. This one is more of a night time bag. I will give the first winner their choice of bag. Good luck to all and thanks for stopping by! I'd love to get a purse like that! Please count me in! It is a true pleasure to meet you. Thanks for offering such sweet candy! I am now a follower. I would love it if you followed me too! I am #458 on The "Carpet Ride". Hope you will come check out my blog candy too! You could win a high-end, handmade, artists greeting card plus surprise crafting goodies. I also have a $50.00 shopping spree to Embellish-Online blog candy going right now! That is an absolutely awesome bag! Great Purse...please include my name..
What a great purse. Please enter me in the giveaway and stop by my blog to enter. I'm number 796 on the list. Oh I love this purse. And I very much need a new one. Love your fabric choice. Lovely bag Connie. Funny how you call them purses. That's what we keep our money in! You'd need a lot of money to fill that! Nice of you to visit my OWOH blog (#7) at Loose Ends! Thank you for the chance to become a happy owner of your giveaway. I love your purse! I am already thinking of so many uses for it! Please count me in. Do pop in if you fly past,OWOH at.. I love the color green, I bet that purse would be very handy to have. Great bag! Love the shape, love the color! Welcome to the carpet ride! What a beautiful purse! I would love to be entered in your giveaway! I think 'lovely' is an understatement, that is one cool bag. I LOVE the color and would be thrilled should I be lucky enough that my name is picked. What a beautiful bag! I am in such envy of all you artists! I have really enjoyed meeting so many of you on this magic carpet ride! Fabulous giveaway! Beautiful blog! Please throw my name into the hat. If your haven't already, please visit me at number 98.
what a great bag! Please include my name! A fun purse....I don't sew....but it would be fun, I think, to make purses...in all kinds of fabrics and colors. Please enter me and come visit me at http://pawsn2stamp.blogspot.com. I am #515 on the carpet ride!! Wonderful purse! I'm glad you decided to join. I need to win that pretty purse. Mine just broke today! Thank you so much for the chance to win! What a CUTE purse and Fabulous giveaway for OWOH! How generous! What a great bag! Is it your own design? Either way, wow! Glad you joined the Ride! Oh that Purse is Fantastic...I love the style and color of it...Beautiful work you have done..please enter me..
Great Give away.. Thanks so much for entering my name for a chance to win.. Hop on the Magic Carpet and fly over to my blog to enter for my prize which is a beaded bracelet. Isn't this fun! That is a very good looking purse and a wonderful if unusual color. Very wearable all year round. Your bag is beautiful!!! Thank you for the opportunity to enter and thank you for stopping by my OWOH event. Great giveaway. Please count me in. Feel free to visit me at # 153 on the magic carpet. Thank you. Love the color of this purse please include my name in the draw and thanks for stopping by my giveaway, gotta Love OWOH! Oh, Connie: That purse is fabulous. I would love for it to end up in my closet! Your purse is absolutely beautiful, just my style! I see you have my button on your blog from my freebie list... great that you joined in the OWOH! I truly admire those who can sew. My grandfather was a tailor and wish I could have picked up his talent. We used to have a Singer sewing machine back home, with the pedal. I loved it and wished we brought it with us when we immigrated to Toronto. Lovely giveaway! Thanks. I love the purse! Please enter me in the drawing. OH great giveaway!! Thanks and ride on over to #189 for my giveaways!! What a great purse!! I love that color! Please enter me in your drawing and stop by my blog to get a chance at my beautiful hand dyed silk scarf! It great to meet you, Constance! Great giveaway, the style and colour are perfect and bead trim is the icing on the cake, please add my name to your draw. ohhh thats such a lovely little thing, thanks for the chance to win, isn't this fun?? I´d love to win your great give away! Please add me to your draw and come and join mine as well! Susan, Sweden nr 821 on the magic carpet! Hi Connie, lovely blog and lovely giveaway! Thank you for sharing. Noticed Kelly Rae on your blog list. She is a sweetie! Came to the little shop I work at for our anniversary party. World gets smaller all the time! Stop by my little blog and say hi and enter. Ooooh, this is wonderful! I LOVE your purse--it looks so roomy and comfortable! And I love handcrafted items! Please sign me up! WOW!!!! This is beautiful, would love to be included in your draw for such a great purse. Thanks for stopping by my place and for your lovely comments. I would love to be entered in the draw for your lovely bag. I've enjoyed looking around and I'll be back. Great to meet your. Please count me in for a chance to win your gorgeous giveway! 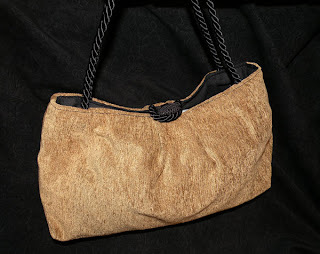 I am giving away for OWOH an Eco Artsy Linen shoulder bag. Thank you for the chance to win. Hope you have a fabulous day! what a generous gift to giveaway. Thanks for visiting my blog and entering my giveaway. Please enter me in yours too. The bag is lovely, and so is your blog. this bag is beautiful- and my favorite color. i would love to win. thanks. so happyi found your blog. I have been poking around on your blog. Very neat stuff. Thank you for the valentines download. I have scrapbook software but I need to learn to use it. When I do....I know have a beautiful layout page from you. Thanks so very much. Love your work! Be sure to stop by my blog #815 OWOH! I love that your focasing more on painting and craft for 2010. You go girl! I've looked at your blogs and flickr and I wonder. Is there anything you don't do?! Your work is amazing and I would love to have this beautiful purse. Thank you for the opportunity to win this amazing giveaway! Please enter my drawing. I'm #387 on the magic carpet! Love the purse...please count me in. Such a lovely give-a-way, I need a new purse as my old one is falling apart...It's been a great carpet ride visiting the many participants this year. Thank you for making my journey a great one! Wow! what a great purse. What a lovely surprise to land on your blog and see not only a gorgeous bag but in my fave colour, looks fab and would hold all my much needed bits and pieces . I love it. Great bag. Thanks for visiting my OWOH blog stop 73. Count me in. OMG, the purse is in my fave color! Thanks for an awesome giveaway! Ah! Love wearable art, and your purse is gorgeous! Count me in, and visit me and enter my giveaway too. Very nice, would love to be entered into your giveaway. Lovely purse....you can never have too many purses....that is for sure :) Please stop over for a visit if you get a chance. Nice to meet you! Super gift! Please enter me in the draw and visit my blog too. This is stunning. I can tell you are an excellent seamstress. Thanks for your nice comment on my blog, too. Great giveawya, please add me in your draw. What a wonderful prize you have in your giveaway! And it's in my favorite color, too. I swear, if you looked in my closet you'd be awash in a sea of sage and olive green. :-) Thanks for visiting my blog and for including my name in your drawing. That's great!! Please visit my OWOH too! Hi Connie! So nice to meet you and visit your heARTFULL blog! Thanks for stopping by today, and for following. I am honored. I am now following your blog, too. I would be ecstatic if I won this beautiful handbag. I am very picky about my handbags. I can tell by one glance if it's right for me. This one is SOOOO right!! Happy carpet riding!!! ooOoooo I would loveeeee to win this! I'm #889 on the magic carpet! Hi Connie...a very nice purse. Please count me in. #186 on the carpet ride! That purse looks beautiful and I would love to participate. Thanks for stopping by my blog! I love that purse! So please include me in your drawing! Thanks for entering my giveaway and please enter me in yours...it is lovely! This purse if fabulous! Thanks for offering such a wonderful giveaway! That is a very lovely handmade purse. Please include me in your drawing. what a fab giveaway, pleas count me in. Why not pop over to my blog and join in my giveaway too. Connie, thanks for the visit to my blog :) Please count me in, olive is one of my 3 favorite colors, so this would be great win for me! Nice to meet you and thanks for stopping by my blog. I'd love to win your purse. Hello, nice to meet you and visit your blog! Please enter me in your giveaway, I could so use this beautiful purse! Please visit my blog to enter #865! Oh Connie I would dearly love love love to be the recipient of this AWESOME bag!! Well done! It's just wonderful. Thanks for visiting my blog giveaway too! I am a former fellow Illinoian, but way west of Chicago. Bless you and your creative talent!!! This purse is awesome! Thanks for the chance to win this fab giveaway. What a lovely bag, and a great giveaway. It's nice to meet you in my blog travels. Thanks for the chance to win! Lovely tote!!! I would love to be the winner! Please include me and come enter my giveaway too! Very lovely bag. Please count me in. Hi Connie, what a lovely idea and post you have. I love the gorgeous purse. I'd love to win. I absolutely love your gifts. Please take time to visit my blog, too, for a chance to win my book, 16 x MOM: A Mastery of Motherhood. I'm working on getting all the country flags. I promise to revisit your's too. Very pretty--one of my fave colors. Please include me in the giveaway. Your purse is lovely-I so want to win it! I am having so much fun riding the magic carpet, hope you are too! Can you ever have too many purses? Please enter my name and thanks for stopping by #234. What a lovely purse. Please enter me in your giveaway and thank you for the opportunity. Well, this is terrific -- and a great color! Please enter my name in your drawing, and if you haven't already stopped at The Marmelade Gypsy (#906 on the magic carpet! ), please come over and enter mine! Nice bag and good luck with your goals/projects for this year! Please stop by (#607)if you get a moment. I love that purse! Thank you for such a wonderful giveaway, I'd love to be included in your draw. I totally love your bag! I look forward to stopping in again! Wow!!! I'd love to win! Dear Connie, thanks so much for visiting with me today on the OWOH magic carpet tour (#263). It's a pleasure to meet you. :) The bag you are offering is SUCH a beautiful color-it is one of my favorite shades of green. I am so happy that you stopped by,i think that your purse is awesome!! Love this bag - the colour, fabric, style...perfect!!! Please count me in! Oooh! Great purse! Thanks for the chance to win! what a great giveaway. thanks so much for the opportunity to enter the drawing. so delighted to meet you through this event. I hope you'll stop by my blog as well. Gorgeous giveaway! Thank you for the chance of winning! This purse is gorgeous! Love the color and the look of it. Enjoyed looking at your blog. Please add my name in the hat. Very elegant Connie - I'd love to be in your draw. Thanks for visiting me Connie and for your kind comments. This is a lovely purse! Have bookmarked your site to visit again. Cheers from Canada! This is absolutely lovely. Please counte me in. Hello from Utah! Thanks for visiting my blog! Wonderful purse you are giving away! I love it! Please count me in on your drawing and have a terrific day! Thanks so much for your visit to my blog. Please include me in your drawing. Have a wonderful weekend. Very nice! I really like your purse. Please enter my name in your drawing. Thanks for stopping by. Now I want to go take a peek at your blog. Your work is gorgeous! Thanks for the chance to win! Your bags are gorgeous. Please enter my name in your drawing. Thanks for stopping by my drawing, too! Thanks for stopping by my blog. Your bags are awesome. Pleaes enter me! Both bags are truly awesome! The green one is my favorite color but I like the other as well! Thanks for stopping by our blog as well. These bags are fantastic, please count me in. When you get a chance, please fly by my blog on your magic carpet, I am OWOH #907. It is so very very nice to meet you. Thanks so much for visiting my blog and taking the time to tell me what you think. Although I may not get back to you right away . . . please know that I do read every comment and appreciate them very much. Hope to see you again soon! I'm a SAHM and have a loving husband of 30 years and 2 wonderful boys. I hope to be able to share with you some of the arts and crafts projects that I create. I am currently trying to sharpen my sewing skills so that I can sew more of my own clothes. I have mostly made quilts and home dec items like curtains and table runners so I hope to learn some new tricks of the trade. Wow and Then - Christmas markets for 2017!! Can't find New Age Dolls? I have a new website name, that's why! Erin Faith Allen . mixed media art . workshops . art journaling in london, uk. Your rainbow is intensely shaded pink, green, and white. What is says about you: You are a contemplative person. You appreciate everyone around you. You are a good listener and your friends are glad to have you around in difficult times. Those around you admire your fresh outlook and vitality.